The Fiona collection by Jennifer Taylor Home is the perfect addition to any living space looking to add a bit of a traditional style. The fabric selected for the collection features Polyester and Rayon blends and engineered for long life. Our wood frames are made from kiln dried birch wood which provides exceptional support and stability. This simple yet elegant floral design is accented with fringes and tassels encompassing the espresso colored wooden legs. The Fiona is an ideal choice for the entryway, hallway or living areas. This ottoman brings class and lounging comfort to any room in the home, whether it’s used as a footrest or additional seating for guests. We offer a unique versatility in design and make use of a variety of trend inspired color palettes and textures. Our products bring new life to the classic American home. 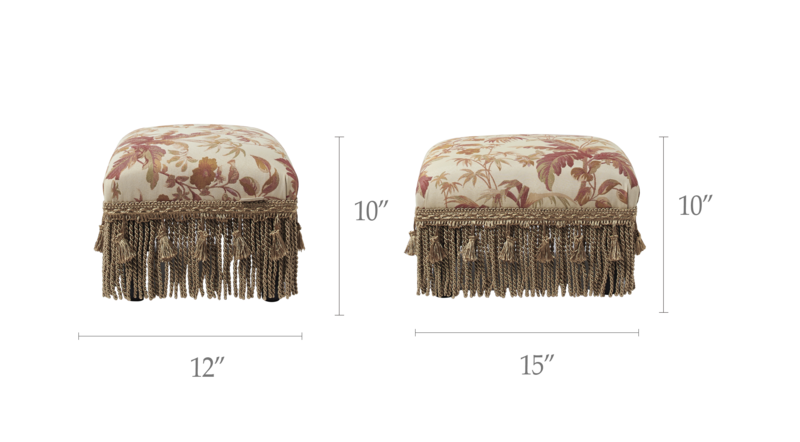 The Fiona Traditional Decorative Footstool is the perfect addition to any living space looking to add a bit of a traditional style. This simple yet elegant floral design is accented with fringes and tassels encompassing the espresso colored wooden legs. This ottoman brings class and lounging comfort to any room in the home, whether it’s used as a footrest or additional seating for guests. 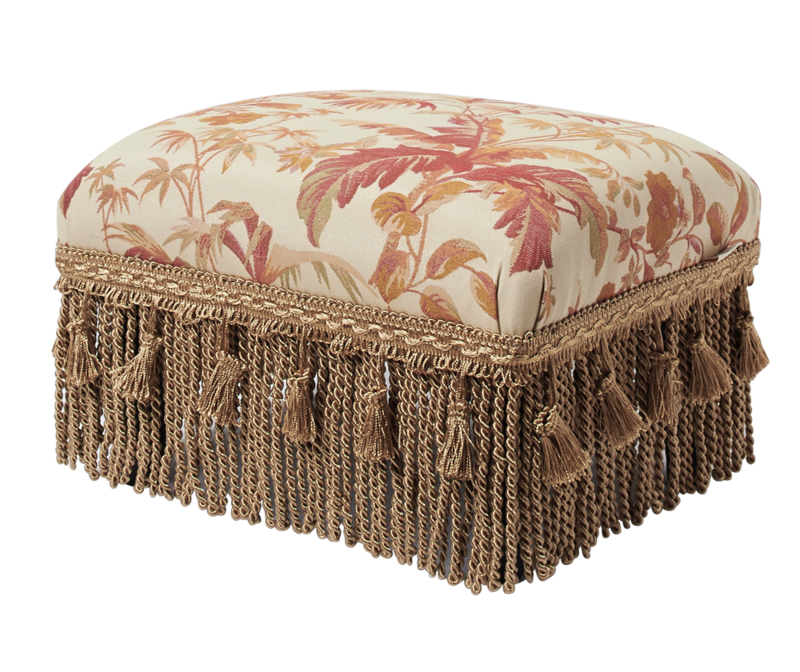 I love the color of the tassels on this footstool! The footstool is sturdy and well made. Love this little stool as does my puppy, hard time getting on the couch and I was tired of the pillows on the floor. now she can jump up, no problem and it looks elegant in the room. These thing don't always have to be for the feet! Prettier even than the pic. Well made and a perfect pairing with my vintage chair. Gorgeous foot stool that matches my chair perfectly. Very well made. I have owned several foot stools, and this piece is a great fit to my home. We needed an ottoman to fit under a bedroom chair when not in use. This ottoman fits perfectly and adds some zip to a neutral earth tone bedroom. it arrived promptly and in perfect condition. It took one minute to attach the legs and was in use 5 minutes later! Perfect! I bought two for rocking chairs. Just wanted a little stool to put my feet up on when sitting in rocking chair. Also wanted them to slide under coffee table when not in use. But they are so nice, I am keeping them out. The colors are bright, but opposite the rockers is a raspberry colored sofa.